In contrast to most man-made machines, biological organisms are typically built from soft and often fluid-like material. How can such liquid matter be controlled in space and time to fulfill precise functions? To uncover the physical principles for such organization, we analyze theoretical models of biological processes using tools from statistical physics, dynamical system theory, fluid dynamics, and information theory. How do chemical reactions affect the behavior of liquid droplets? How does the complex shape of the nasal cavity affect air flow? How does our sense of smell encode complex odors? We recently published a paper in Phys. Rev. 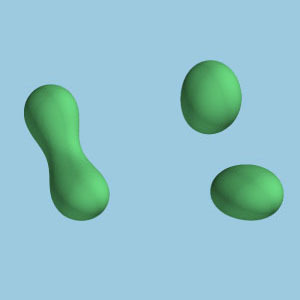 Letters, where we showed that droplets driven by non-equilibrium chemical reactions can center solid-like particles inside themselves. We are looking for a postdoc working on droplet formation in elastic media. Review "Physics of Active Emulsions"
We wrote a review on droplet dynamics in non-equilibrium environments.